Distress buffalo with all over stitch. Inlay and overlay, 10" top. 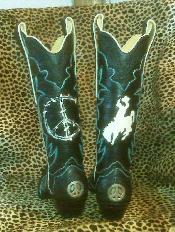 Black tooled wingtip, foxing, collar, with inlays, raised stitching and sterling peace signs. 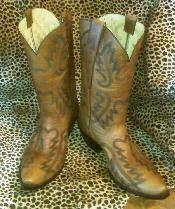 See logo boots for more photos. This style available only @ Desperado. Dark Chocolate with pink wingtip and foxing. 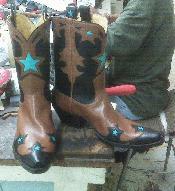 Black roo with inlays of black lizard. Black lizard gallego with custom stitch and inlays. 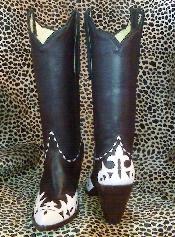 Black calf with natural snake and black crystals.